For other uses of "Skylon", see Skylon (disambiguation). The Skylon vehicle is intended to be an aircraft designed to reach orbit. Skylon is a series of designs for a single-stage-to-orbit spaceplane by the British company Reaction Engines Limited (REL), using SABRE, a combined-cycle, air-breathing rocket propulsion system. The vehicle design is for a hydrogen-fuelled aircraft that would take off from a purpose-built runway, and accelerate to Mach 5.4 at 26 kilometres (16 mi; 85,000 ft) altitude (compared to typical airliners' 9–13 kilometres (6–8 mi; 30,000–40,000 ft)) using the atmosphere's oxygen before switching the engines to use the internal liquid oxygen (LOX) supply to take it into orbit. :5 It could carry 17 tonnes (17,000 kg; 37,000 lb) of cargo to an equatorial low Earth orbit (LEO); up to 11 tonnes (11,000 kg; 24,000 lb) to the International Space Station, almost 45% more than the capacity of the European Space Agency's Automated Transfer Vehicle; or 7.3 tonnes; 7,300 kilograms (16,000 lb) to Geosynchronous Transfer Orbit (GTO), over 24% more than SpaceX F9 RTLS (As of 2018[update].) The relatively light vehicle would then re-enter the atmosphere and land on a runway, being protected from the conditions of re-entry by a ceramic composite skin. When on the ground, it would undergo inspection and necessary maintenance, with a turnaround time of approximately two days, and be able to complete at least 200 orbital flights per vehicle. As work on the project has progressed, information has been published on a number of design versions, including A4,:Fig 1 p165 C1, C2, and D1. Testing of the key technologies was successfully completed in November 2012, allowing Skylon's design to advance from its research phase to a development phase. As of 2017[update], an engine test facility was being built at Westcott and if all goes to plan, the first ground-based engine tests could happen in 2020, and SABRE engines could be performing unmanned test flights by 2025. In paper studies, the cost per kilogram of payload carried to LEO in this way is hoped to be reduced from the current £1,108/kg (as of December 2015[update]), including research and development, to around £650/kg, with costs expected to fall much more over time after initial expenditures have amortised. In 2004, the developer estimated the total lifetime cost of the Skylon C1 programme to be about $12 billion. As of 2017[update], only a small portion of the funding required to develop and build Skylon had been secured. For the first couple of decades the work was privately funded, with public funding beginning in 2009 through a European Space Agency (ESA) contract. The British government pledged £60 million to the project on 16 July 2013 to allow a prototype of the SABRE engine to be built, contracts for this funding were signed in 2015. Skylon has its origins within a previous space development programme for an envisioned single-stage-to-orbit spaceplane, known as HOTOL. In 1982, when work commenced on the HOTOL by several British companies, there was significant international interest to develop and produce viable reusable launch systems, perhaps the most high-profile of these being the NASA-operated Space Shuttle. In conjunction with British Aerospace and Rolls-Royce, a promising design emerged to which the British government contributed £2 million towards its refinement; British engineer Alan Bond was amongst the engineers who worked on HOTOL. However, during 1988, the British government decided to withdraw further funding from the programme, resulting in development work being terminated. Aerospace publication Flight International observed that HOTOL and other competing spaceplane programmes were "over-ambitious" and that development on such launch systems would involve more research and slower progress than previously envisioned. The Skylon was developed from the British HOTOL project. Following the setback of HOTOL's cancellation, in 1989 Alan Bond, along with John Scott-Scott and Richard Varvill decided to establish their own company, Reaction Engines Limited, to pursue the development of a viable spaceplane and associated technology using private funding. In 1993, REL publicly revealed its spaceplane proposal, which it named Skylon after the Skylon structure that had inspired Alan Bond at the Festival of Britain exhibition. Skylon was a clean sheet redesign based on lessons learned during development of HOTOL, the new concept again utilised dual-mode propulsion system, using engines that could combust hydrogen with the external air during atmospheric flight; but again SABRE was a clean sheet redesign based on lessons learned during development of HOTOL's RB545 engine Early on, Skylon was promoted by the company to the ESA for its Future European Space Transportation Investigations Programme (FESTIP) initiative, as well as seeking out both government or commercial investment in order to finance the vehicle's development. REL has also sought to form ties with other companies with the aim of producing an international consortium of interested firms to participate in the Skylon programme. After securing additional funding in the 1990s, Reaction Engine's initial design underwent radical revision. A computer-generated image of the Skylon spaceplane climbing to orbit. REL intends ultimately to operate as a for-profit commercial enterprise which, upon the completion of development, shall manufacture Skylon vehicles for multiple international customers who shall operate their fleets directly, while being provided with support from REL. Skylon has been designed with the target of achieving no less than 200 flights per vehicle. According to the company, its business plan is to sell vehicles for $1 billion each, for which it has forecast a market for at least 30 Skylons, while recurring costs of just $10 million per flight are predicted to be incurred by operators. While the REL intends to manufacture some components directly, such as the engine precooler, other components have been designed by partner companies and a consortium of various aerospace firms is expected to handle full production of Skylon. In service, Skylon could potentially lower the cost of launching satellites which, according to evidence submitted to the UK parliament by REL, is forecast to be around £650/kg; as of 2011, the average launch cost using conventional methods was estimated to be roughly £15,000/kg. Amongst other prospective operations, Skylon would be capable of transporting payloads of up to 10-tonnes to the International Space Station. REL has also completed internal studies into the use of Skylon as a launch platform for a network of space-based solar power satellites, which have been historically unfeasible due to high launch costs. According to business publication Management Today, Skylon has been discussed as a possible replacement for NASA's Space Shuttle programme. "This is an example of a British company developing world-beating technology with exciting consequences for the future of space." During February 2009, following on from a series of extended discussions with the British National Space Centre (which later became the UK Space Agency), it was announced that a major funding agreement had been established between the British National Space Centre, ESA and REL, committing €1 million ($1.28 million) for the purpose of producing a demonstration engine for the Skylon programme by 2011. The initiative, known as the Technology Demonstration Programme, was scheduled to last approximately 2.5 years, during which further financing in the form of €1 million was made available by the ESA. The 2009 agreement allowed REL to involve several external companies, including EADS-owned Astrium, the University of Bristol and the German Aerospace Center (DLR), in further development work. As a consequence of the enactment of the Technology Demonstration Programme, REL was able to transition from a Technology Readiness Level (TRL) of 2/3 up to 4/5 within a matter of months. The European Space Agency is funding proof of concept work for Skylon from UK contributions. This work is focusing on demonstrating the viability of the advanced British engine technology that would underpin the project. Initial work will be completed in mid 2011 and if the trial is successful, we will work with industry to consider next steps. In June 2013, George Osborne, the-then Chancellor of the Exchequer, stated that the British government would be giving £60 million towards the further development of the SABRE engine. The grant was contingent upon REL having an industrial partner. The first grant of £50 million was approved by the European Commission in August 2015. In October 2015, British defence conglomerate BAE Systems entered into an agreement with Reaction Engines, under which it would invest £20.6 million in REL to acquire 20% of its share capital, as well as to provide assistance in the development of the SABRE engine. During July 2016, the second grant of £10 million was approved by the ESA. On 25 September 2017 it was announced that the U.S. Defense Advanced Research Projects Agency (DARPA) had awarded a contract to Reaction Engines for an undisclosed amount to conduct high-temperature airflow testing at a Colorado, United States site of a Reaction Engines precooler called HTX. Testing work is scheduled to start in 2018. On April 2018 Reaction Engines announced Boeing and Rolls-Royce would joining BAE Systems as investors in SABRE engine development. A total of $37.5 million of new funding is to be provided including contributions from Baillie Gifford Asset Management and Woodford Investment Management. The precooler rig that tested the heat exchange system of the SABRE engine. From 2007 to 2009 REL worked with University of Bristol and Airborne Engineering on Project STERN (Static Test Expansion/Deflection Rocket Nozzle), which tested REL's engine ignition system, a REL designed air breathing hydrogen rocket engine, and investigated the flow stability and behaviour of with Dr Neil Taylor's expansion deflection nozzle design via multiple test-firings by Airborne Engineering. An expansion deflection nozzle is capable of compensating for the changing ambient pressure encountered while gaining altitude during atmospheric flight, thus generating greater thrust and thereby efficiency. Work on STERN was continued in project STRICT (Static Test Rocket Incorporating Cooled Thrust-chamber), which investigated the stability of the engine's exhaust flow and the dissipation of the generated heat into the engine walls. The results and designs delivered by the both the STRICT and STERN projects were subsequently declared by REL to have been "a great success". Static testing of the engine precooler began in June 2011, marking the start of Phase 3 in the Skylon development programme, In April 2012, REL announced that the first series of the precooler test programme had been successfully completed. On 10 July 2012, REL announced that the second of three series of tests has been completed successfully, and the final series of tests would begin the following month after the testing facilities had been upgraded to allow testing of −150 °C (−238 °F) temperatures. ESA's propulsion division audited the precooler tests during mid-2012 and found the results satisfactory. On 9 May 2011, REL stated that a preproduction prototype of the Skylon could be flying by 2016, and the proposed route would be a suborbital flight between the Guiana Space Centre near Kourou in French Guiana and the North European Aerospace Test Range, located in northern Sweden. Pre-orders are expected in the 2011–2013 time frame coinciding with the formation of the manufacturing consortium. On 8 December 2011, Alan Bond stated that Skylon would enter into service by 2021–2022 instead of 2020 as previously envisaged. On 13 July 2012, ESA Director-General Jean-Jacques Dordain publicly stated that the ESA would be holding a series of talks with REL with the aim of developing a further "technical understanding". In November 2012, REL announced that it would commence work upon a three-and-a-half-year project to develop and build a test rig of the Sabre engine to prove its performance across both the air-breathing and rocket modes. The Skylon spaceplane is designed as a two-engine, "tailless" aircraft, which is fitted with a steerable canard. "...we’re competing with expendable rockets, a machine that is only used once". 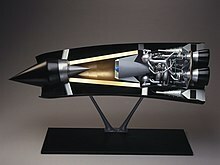 Because the SABRE engine uses the atmosphere as reaction mass at low altitude, it will have a high specific impulse (around 4,100–9,200 seconds for SABRE 4,:6 or 3,600 seconds for SABRE 3:3), and burn about one fifth of the propellant that would have been required by a conventional rocket. Therefore, Skylon would be able to take off with much less total propellant than conventional systems. The weight reduction enabled by the lower quantity of propellant needed meant that the vehicle would not require as much lift or thrust, which in turn permits the use of smaller engines and allows for the use of a conventional wing configuration. While flying within the atmosphere, the use of wings to counteract gravity drag is more fuel-efficient than simply expelling propellant (as in a rocket), which again serves to reduce the total amount of propellant needed. The payload fraction would be significantly greater than normal rockets and the vehicle should be fully reusable, capable of performing in excess of 200 launches. Operating an air-breathing jet engine at velocities of up to Mach 5.5 poses numerous engineering problems; several previous engines proposed by other designers have worked well as jet engines, but performed poorly as rockets. This engine design aims to be a good jet engine within the atmosphere, as well as being an excellent rocket engine outside; however, the conventional problem posed by operating at Mach 5.5 has been that the air coming into the engine rapidly heats up as it is compressed into the engine; due to certain thermodynamic effects, this greatly reduces the thrust that can be produced by burning fuel. Attempts to avoid these issues have typically resulted in the engine being much heavier (scramjets/ramjets) or has greatly reduced the thrust generated (conventional turbojets/ramjets); in either of these scenarios, the end result would be an engine that possesses a poor thrust to weight ratio at high speeds, which in turn would be too heavy to assist much in reaching orbit. The SABRE engine design aims to avoid the historic weight-performance issue by using some of the liquid hydrogen fuel to cool helium within a closed-cycle precooler, which quickly reduces the temperature of the air at the inlet. The air is then used for combustion in a similar manner to a conventional jet engine; once the helium has left the pre-cooler, it is further heated by the products of the pre-burner, giving it enough energy to drive the turbine and the liquid hydrogen pump. As a consequence of the air being cooled at all speeds, the jet can be built of light alloys and the weight is roughly halved. Additionally, more fuel can be burnt at high speeds. Beyond Mach 5.5, the air would normally become unusably hot despite the cooling; accordingly, the air inlet is closed upon attaining this speed and the engine instead is solely fed via on-board liquid oxygen and hydrogen fuel, as in a traditional rocket. The currently proposed Skylon model D1 is a large vehicle, possessing a length of 83.13 metres (272 ft 9 in) and a diameter of 6.30 metres (20 ft 8 in). The fuselage of the Skylon is expected to be a silicon carbide reinforced titanium space frame;:8 a light and strong structure that supports the weight of the aluminium fuel tanks and to which the ceramic skin is attached. :11 Multiple layers of titanium foil thermal insulation are sandwiched between the skin and frame:15 to protect the inside of Skylon from the heat of hypersonic flight and the intense heat of re-entry. The Skylon shall possess a retractable undercarriage, equipped with high pressure tyres and water-cooled brakes; if any difficulties were to occur just before a take-off, the brakes would be applied to stop the vehicle, the water boiling away to dissipate the heat. :21 During a normal landing, the empty vehicle would be far lighter, and hence the water would not be required,:21 so upon a successful take-off, the 1,410 kilograms (3,110 lb) of water would be jettisoned. When this feature was introduced in the C1 model of the design the weight of the brakes was reduced from around 3,000 to 415 kilograms (6,600 to 915 lb). When on the ground, it would undergo inspection and necessary maintenance, with a turnaround time of approximately two days, and be able to complete at least 200 orbital flights per vehicle. The cargo bay contains two payload attachment locations, both consisting of an identical sets of three trunnion mounts:12,15 a signalling connection is included on the keel trunnion. ^ a b Bond, Alan (2010). "Travelling at the edge of space: Reaction Engines and Skylon in the next 20 years" (video) (lecture). Reaction Engines Ltd. Retrieved 9 March 2011. Skip 6 minute irrelevant intro. ^ a b c d e "Skylon FAQ". Frequently Asked Questions. Reaction Engines Ltd. 2010. Archived from the original on 2 June 2015. Retrieved 25 January 2011. ^ a b c d e f g h i j k l m n o Hempsell & Longstaff (2009). "SKYLON[C2] Users' Manual" (PDF). Reaction Engines Ltd. Archived from the original (PDF) on 19 December 2009. ^ Clark, Stuart (17 July 2013). "Sabre rocket engine could open up access to space as never before". The Guardian. London. ^ ""Capabilities & Services (2016)". SpaceX. ^ Elon Musk [@elonmusk] (30 April 2016). "@elonmusk Max performance numbers are for expendable launches. Subtract 30% to 40% for reusable booster payload" (Tweet) – via Twitter. ^ a b Varvill, Richard; Bond, Alan (May 1993). "Skylon: A Key Element of a Future Space Transportation System". Spaceflight. Vol. 35 no. 5. London: British Interplanetary Society. pp. 162–166. ISSN 0038-6340. ^ a b Varvill, Richard & Bond, Alan. "The SKYLON Spaceplane" (PDF). Journal of the British Interplanetary Society. 57: 22–32. Archived from the original (PDF) on 15 June 2011. ^ a b c d e f g h i j k l m n o p q r s t u v w Hempsell & Longstaff (2014). "Skylon User Manual" (PDF). Reaction Engines Ltd. Archived from the original (PDF) on 28 March 2016. Retrieved 20 June 2015. 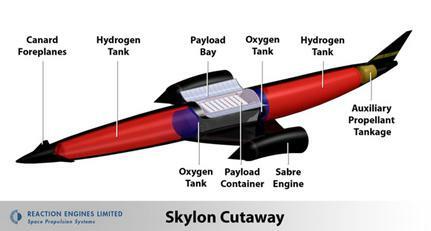 ^ a b c "Skylon spaceplane engine concept achieves key milestone". BBC news. 28 November 2012. Retrieved 28 November 2012. ^ "Hypersonic Flight 'Breakthrough' Could Have Us in Tokyo by Lunch". Wired. 30 November 2012. ^ "BAE invests in space engine firm Reaction Engines". BBC News. 2 November 2015. ^ "SpaceX published Launch costs for Falcon Heavy to LEO for 2016 launch". SpaceX. 2015. Archived from the original on 7 October 2013. ^ "UK earmarks £60m for super-fast space rocket engine". The Guardian. London. 16 July 2013. ^ a b "Reaction Engines Ltd : Company Background". Reaction Engines Ltd. Archived from the original on 8 August 2010. Retrieved 25 September 2010. ^ a b c d Thisdell, Dell. "Skylon concept could be next spaceplane." Flight International, 14 June 2011. ^ "Slow road to reusability." Flight International, 1 January 2000. ^ "Story so far | Reaction Engines". Reaction Engines Ltd. Archived from the original on 12 September 2017. Retrieved 18 September 2017. ^ a b "Reusable Launch Vehicle Programs and Concepts" (PDF). Associate Administrator for Commercial Space Transportation (AST). January 1998. Archived from the original (PDF) on 27 August 2017. Retrieved 18 September 2017. ^ a b c d e f g Wang, Brian. "Progress to the Skylon Single Stage to Orbit Spaceplane for 2019." Next Big Future, 31 January 2009. ^ Mark Hempsell (6 August 2009). "Broadcast 1203" (Interview). Interviewed by Dr David M. Livingston. The Space Show. ^ a b c d e f "Written evidence from Reaction Engines Limited". Rebalancing the Economy: Trade and Investment - Business, Innovation and Skills Committee. UK Parliament. January 2011. Archived from the original on 2 February 2016. Retrieved 27 January 2011. ^ Emma Haslett (1 June 2011). "Skylon to Replace Space Shuttle?". Brits blast off. Management Today. ^ House of Commons: Science and Technology Committee 2007, p. 262. ^ "Memorandum submitted by the Association of Aerospace Universities". Parliament of the United Kingdom. 2000. ^ a b Coppinger, Rob (19 February 2009). "Skylon spaceplane engine technology gets European funding". Flight Global. Flight International. ^ Jonathan Amos (19 February 2009). "Skylon spaceplane gets cash boost". BBC News. ^ Jeremy Hsu (2009). "British Space Plane Concept Gets Boost". space.com. ^ "Rockets and Skylon". 20 Years Since HOTOL: Reaction Engines Ltd and SKYLON. UK Rocketeers. 2009. Retrieved 1 October 2010. ^ "Reaction Engines Celebrates 20 Years, Looks Forward to Success with Skylon". 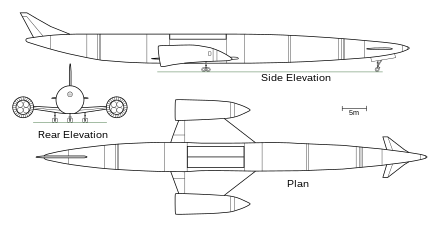 Parabolic Arc. 26 August 2009. ^ Page, Lewis "ESA: British Skylon spaceplane seems perfectly possible (whizzo robot runway rocketplane cleared to proceed)". The Register. 24 May 2011. ^ a b c d e f g h Emspak, Jesse. "REL’s Skylon spaceplane aims to take on SpaceX with a reusable rocket design." theverge.com, 8 March 2016. ^ "@George_Osborne." Twitter, 27 June 2013. ^ "State aid: Commission approves £50 million UK support for the research and development of an innovative space launcher engine"
^ Norris, Guy (1 November 2015). "BAE Takes Stake In Reaction Engines Hypersonic Development". aviationweek.com. Aviation Week & Space Technology. ^ Hollinger, Peggy; Cookson, Clive (2 November 2015). "BAE Systems to pay £20.6m for 20% of space engine group". CNBC. ^ "Reaction Engines secures funding to enable development of SABRE demonstrator engine" (Press release). Cullham Science Centre, United Kingdom: Reaction Engines Ltd. Archived from the original on 20 March 2017. Retrieved 18 September 2017. ^ "Project STERN". Reaction Engines Ltd. Archived from the original on 8 May 2012. ^ a b "Reaction Engines Ltd : Projects STERN and STRICT". Reaction Engines Ltd. Archived from the original on 14 August 2010. Retrieved 25 September 2010. ^ Dan Thisdell (1 September 2011). "Spaceplane engine tests under way". Flight Global. Flight International. ^ "Big Test Looms for British Space Plane Concept". Space.com. 2011. Retrieved 18 April 2011. ^ "Key tests for Skylon spaceplane project". BBC News. 27 April 2012. ^ "MAJOR ADVANCE TOWARDS THE NEXT JET ENGINE" (PDF) (Press release). Reaction Engines Ltd. 10 July 2012. Archived from the original (PDF) on 13 August 2012. ^ "Move to open sky for Skylon spaceplane". BBC News. 11 July 2012. ^ Thomson, Ian (29 November 2012). "European Space Agency clears SABRE orbital engines". The Register. ^ "Skylon Phase 3 Development: Q&A". Rocketeers.co.uk. 9 May 2011. Retrieved 3 December 2012. ^ Bond, Alan (8 December 2011). Progress on the SKYLON Reusable Spaceplane (PDF). 7th Appleton Space Conference. Reaction Engines Ltd. Archived from the original (PDF) on 12 July 2012. Retrieved 3 December 2012. ^ "Europe's Next-gen Rocket Design Competition Had Surprise Bidder". Space News. 13 July 2012. ^ a b Varvill & Bond 2003, p. 108. ^ "Reaction Engines Ltd : Current Projects : SKYLON – Passenger Capability". Reaction Engines Ltd. Archived from the original on 15 June 2012. Retrieved 25 September 2010. ^ a b J.L. Scott-Scott; M. Harrison & A.D. Woodrow (2003). "Considerations for Passenger Transport by Advanced Spaceplanes" (PDF). Journal of the British Interplanetary Society. 56: 118–126. Archived from the original (PDF) on 19 March 2009. ^ a b c d e f g h i j k l m "SABRE engine". The Sabre Engine. Reaction Engines Ltd. 2010. ^ Varvill & Bond 2004, p. 22. ^ "Reaction Engines Limited : Technology Demonstration Programme". Reaction Engines Ltd. Archived from the original on 16 February 2010. Retrieved 25 September 2010. ^ "Revolutionary space engine system for Skylon tested". BBC News. 27 April 2012. ^ "Reaction Engines Ltd : Current Projects : SKYLON – The Vehicle". Reaction Engines Ltd. Archived from the original on 15 July 2010. Retrieved 25 September 2010. ^ a b c Davies, Philipa. Progress on Skylon and SABRE (IAC-15-D2.1.8). 66th International Astronautical Congress (IAC 2015): Space Transportation Solutions and Innovations symposium. Reaction Engines Ltd. Archived from the original on October 2015. ^ Varvill & Bond 2004, p. 25. ^ "Space Access: SKYLON – Technical". Reaction Engines. 2014. Archived from the original on 17 December 2015. ^ a b c d Hempsell, Mark. A Technical Overview of a SKYLON Based European Launch Service Operator. 65th International Astronautical Congress (IAC 2014): D2 Space Transportation Solutions and Innovations symposium. Reaction Engines Ltd. IAC-14.D2.4.5. ^ Skylon. Mark Wade, Astronautix Enyclopedia. Varvill, Richard; Bond, Alan (May 1993). "Skylon: A Key Element of a Future Space Transportation System". Spaceflight. Vol. 35 no. 5. London: British Interplanetary Society. pp. 162–166. ISSN 0038-6340. Varvill, Richard; Bond, Alan (2003). "A Comparison of Propulsions Concepts for SSTO Reusable launchers" (PDF). Journal of the British Interplanetary Society. 56: 108–17. Bibcode:2003JBIS...56..108V. Archived from the original (PDF) on 28 June 2012. Varvill, Richard; Bond, Alan (2004). "The SKYLON Spaceplane" (PDF). Journal of the British Interplanetary Society. 57: 22–32. Bibcode:2004JBIS...57...22V. Archived from the original (PDF) on 16 May 2011. Hempsell, Mark; Longstaff, Roger (2009). "Skylon User Manual v1.1" (PDF). Reaction Engines Ltd. Archived from the original (PDF) on 18 April 2016. House of Commons Science and Technology Committee (2007). "2007: A Space Policy - Seventh Report of Session 2006-08". II. Her Majesty's Stationery Office. ISBN 978-0-215-03509-7. Varvill, Richard; Bond, Alan (2008). "The SKYLON Spaceplane - Progress to Realisation". Journal of the British Interplanetary Society. 61: 412–418. Bibcode:2008JBIS...61..412V. Hempsell, Mark; Bond, Alan; Bond, R; Varvill, Richard (October 2011). Progress on the SKYLON and SABRE Development Programme (IAC-11.D 2.4.2, IAC-11.B3.2.6). 62nd International Astronautical Congress. Cape Town. Bond, Alan (8 December 2011). Progress on the SKYLON Reusable Spaceplane (PDF). 7th Appleton Space Conference (RALSpace). Hempsell, Mark; Longstaff, Roger (2014). "Skylon User Manual v2.1" (PDF). Reaction Engines. pp. 1–52. Archived from the original (PDF) on 29 November 2015. Hempsell, Mark (September 2013). Progress on SKYLON and SABRE (IAC-13.D2.4.6). 64th International Astronautical Congress. Beijing, China. Davis, Philippa; Hempsell, Mark; Varville, Richard (2015). Progress On Skylon and SABRE (IAC-15-D2.1.8). 66th International Astronautical Congress. Wikimedia Commons has media related to Skylon (spacecraft). Video – SKYLON – Operations from Reaction Engines Ltd on Vimeo. This page was last edited on 20 March 2019, at 23:56 (UTC).